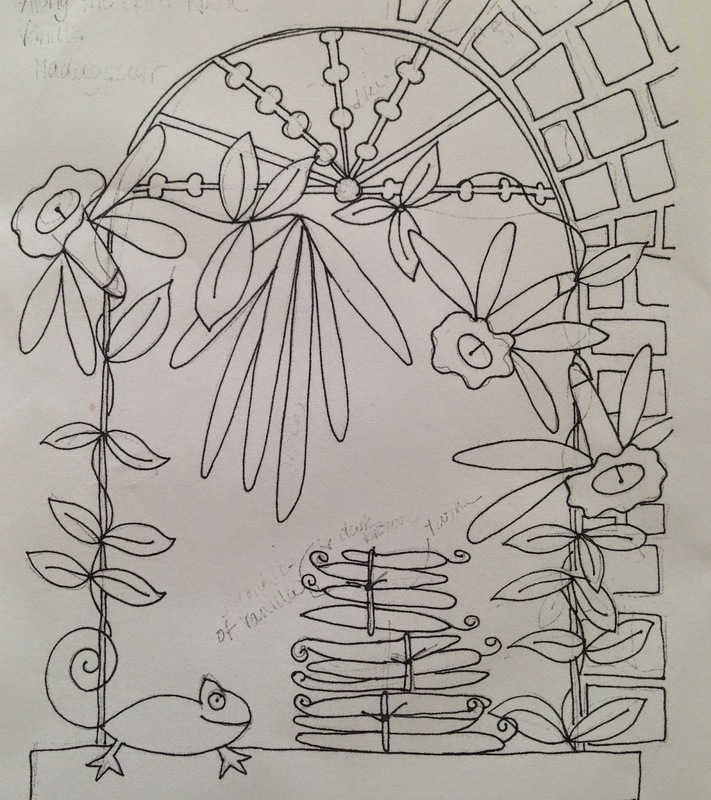 My original sketch for the window, with notes. 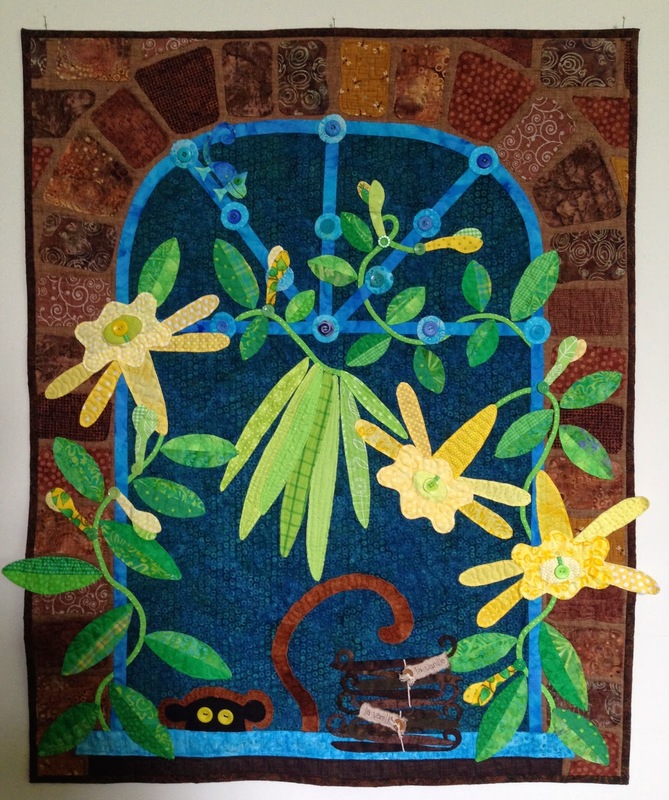 About a year ago I was asked by Paula Golden to participate in a quilt titled "Along the Spice Route." I had no problem picking a spice from the list . . . vanilla . . . and even though there were some very specific instructions (the quilt had to include a window or an arch that looked out on a marketplace), I actually came up with an idea right away (see left!). And the quilt wasn't due until June 30th, so I had plenty of time. Well, I think we all know where this is going. On June 29th in Erie, Pennsylvania, I started sewing and I didn't stop until August 6th. One day after Paula's "drop dead" deadline, which wasn't the real drop dead deadline because Paula knows how quilters like me operate and she didn't tell me the real drop dead deadline. Here's what I learned about vanilla along my journey: In 1841, a 12-year-old slave on Reunion, one of the Bourbon Islands off the south east coast of Africa, discovered the secret to hand-pollinating a yellow orchid and changed the flavor of history forever. Until the 1400s, the tlilxochitl vine was known only to the Totonac Indians on the east central coast of Mexico. Then the Aztecs arrived, conquered the tribe, and forced the Totonocans to pay tributes with, among other things, the fruit of the tlilxochitl vine. In 1520, a Spanish conquistador, Hernando Cortez, showed up and swiftly conquered the Aztecs. Upon his defeat, the Aztec emperor Montezuma offered Cortez a drink -- a mixture of ground corn, cacao beans, honey, and tlilxochitl pods. Cortez was enchanted with the bold new flavor. He executed Montezuma, and Spain took control of the vine. Plants and pods were shipped to Spain and then to other parts of Europe, and the new drink became popular among the rich and noble. (Thomas Jefferson brought vanilla pods to the colonies after a visit to France . . . but that was much later.) So, back in Europe . . . For 80 years or so the vine was only used as an ingredient in the chocolate drink crafted by the Aztecs. Enter Queen Elizabeth the First's apothecary, Henry Morgan, who realized in 1602 that the pods could be used as a flavoring. Even though the pods had more uses, Mexico was still the only source of the pods until the 1700s, when it was smuggled out of Mexico and planted in the French territory of Reunion. The plant, named Vanilla planifolia by a French botanist, Charles Plumier, in 1743, grew well on the island, but never produced pods. Eventually scientists realized that, in their native habitat, vanilla orchids are pollinated by a bee only found in Mexico. With no natural pollinators on Reunion, leading botanists and horticulturists of the time tried to unlock the secret of how to pollinate the flower by hand with little luck. Which brings us back around to young Edmond. Vanilla would have remained an obscure spice, if not for his discovery. I love vanilla, so I'm particularly grateful to Edmond Albius. For the past few years my middle son, Jack, and I have been brewing and bottling our own vanilla extract at home according to a recipe we found in Make the Bread, Buy the Butter: What You Should and Shouldn't Cook from Scratch -- Over 120 Recipes for the Best Homemade Foods, by Jennifer Reese (who also writes one of my favorite blogs, The Tipsy Baker.) We've used vanilla pods from Madagascar, as well as pods from Tahiti and Mexico. We both love to bake and we add vanilla to everything. My friend and neighbor Katina was helping me figure out how to label the vanilla pods when her 17-year-old daughter, Marquette, walked through the kitchen. 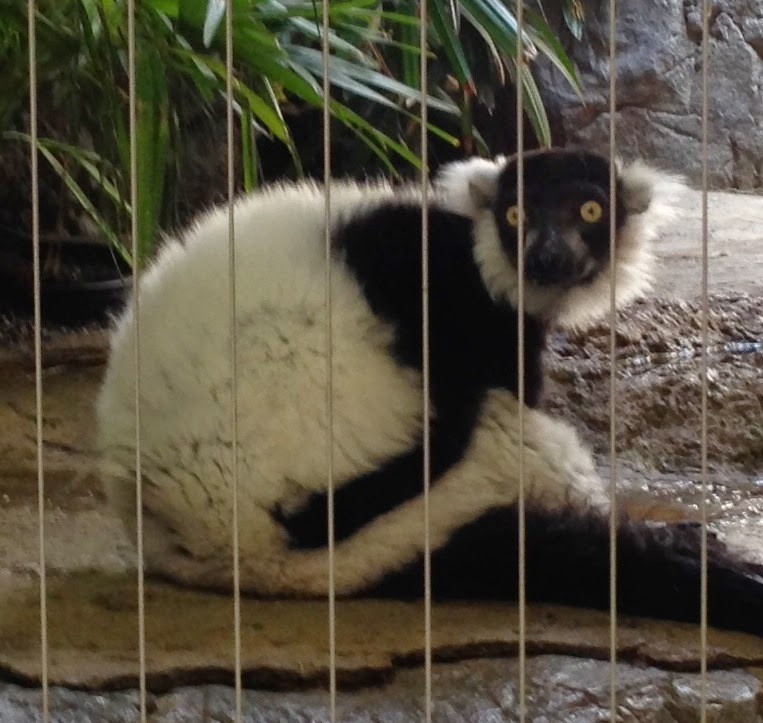 Marquette suggested making the lemur's tail curve around to fill in some of the space at the bottom and point to the vanilla pods (which was an excellent idea). Choosing the fabrics for the quilt was so much fun. I used many batiks to represent fabrics of the tropical island of Madagascar, but I also "imagined" traders visiting the islands, and added a Japanese fabric (it's one of the bricks with tiny dragonflies), corduroy, linen, gingham, flannel, and quilting cottons. I have a huge button collection and I always add lots of buttons to my appliqué quilts. The blue one on the bottom middle of the arch was made in South Africa. Another one came from Israel. Some are "antiques" and others are modern. cuckooquilts. Simple theme. Powered by Blogger.